Are you looking for an exciting activity for your group? Would you like it in a way you can explore Madrid, learn and have a lot of fun? Treasure hunt Madrid is the answer to your search. Madrid is a beautiful city with many monuments, squares, parks and secrets. Treasure hunt Madrid will allow you to experience the city in a whole new way. You will have to pay attention to every detail, because there could be hidden hints everywhere to find the treasure! Treasure Hunt Madrid is the best outdoor teambuilding activity, that will test the intellectual and physical skills of every participant to achieve the final goal: the treasure! We also include 2 drinks with some tapas in our Treasure Hunt Madrid, so you can rest and reload some energy between the challenges. We can include different themes in this activity according to your group, interests and requests. It is a set of different kind of games played generally outside with varied tests to win a prize, but it is mainly about testing your skills and having fun. The games of the Treasure Hunt can be played individually or for more fun in groups where the teamwork and to share your skills with each other are important. 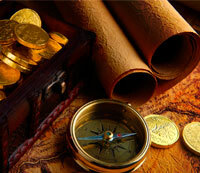 The objective of the Treasure Hunt is passing the test as soon as possible, before the other groups.